When you buy a new horse and bring him or her to your farm, sometimes the relationship between you and the animal isn’t instant. So if you’re looking to build a welcoming relationship with your newest horse, here a few tips to get off on the right hoof. The most important step early on is to tread cautiously and carefully at first, avoiding making an approach toward the horse in a loud, bombastic manner. Your horse is a new environment, and sudden movements or loud noises can make them skittish or nervous. After all, how would you react if your new boss out of nowhere came up and saddled you with a ton of things you weren’t accustomed to? Instead, start by observing your animal in the stable and try and invite the horse to come to you and allow you place a saddle on him or her once comfortable. Taking this slow and respectful approach can make a world of difference at the start of your relationship. How would you feel if some came up to you and grabbed your arm without consent? Well, a horse feels the same way. Silly as it may sound, you should ask the horse and let them allow you to pet them or place a saddle on them. Treating your horse with deference and respect shows your new animal that you want them to be comfortable and want to work with them, not put them to work. Starting to touch a horse when they don’t expect it could lead to a nervous or aggressive action, not to mention make them uncomfortable for future attempts at growing your bond. Most horses do enjoy facial contact from humans, but it’s on you to discover where your horse likes to be touched on their face. It could be their ears, near the eyes or on their muzzle. Try each one carefully to see which one they enjoy best. This is a great way to build comfort and trust with one another. 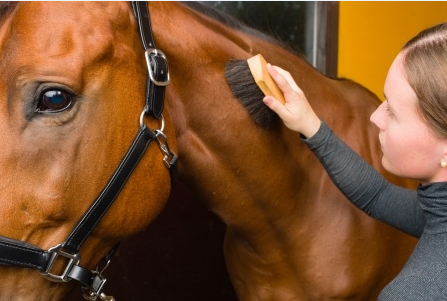 A horse’s face can also provide strong cues about how they feel about a given touch or action. For example, the way a horse extends their nose toward you could mean that they welcome your approach or that they want nothing to do with you. Read these cues properly and you begin to understand one another – and what’s more important in building a positive working relationship with any other creature than communication? Deer Creek Structures offers high-quality portable horse barns that will help keep your new or current horses safe from the elements and offer then a secure and protected place to sleep at night.